Ash and co. are on Lapras again. Ash is staring at his trophy that he recently won. They are heading back to Pallet Town. Suddenly, Lapras jerks forward and moves to a different direction. Up ahead, Ash sees a whole school of Lapras. Misty wonders if they know Ash's Lapras. Tracey thinks that Lapras belongs to the school and was separated from them. Ash remembers the time when he first met Lapras. Lapras calls out to the school, but the ignore Ash's Lapras. One of the Lapras stares back, but it turns away. 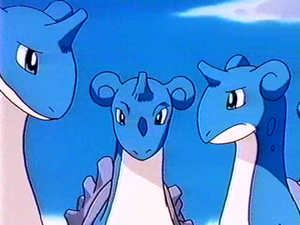 This makes Lapras sad. Ash shouts out to the Lapras. The Lapras attacks Ash and co. with Water Gun. Then it uses Mist to escape. At the Pokémon Center, Ash gives Professor Oak a call. Professor Oak thinks that the Lapras are afraid of people, probably because they have been attacking the Lapras. Officer Jenny walks up. She says that many pirates have been threatening the Lapras. She explains that the island is a No-Capture Zone, but there have been many reports about the pirates. Ash wonders if the pirates are like Captain Hook, but Officer Jenny tells him that they call them Captain Crook. Ash thinks that Team Rocket is behind all of this. He tells Officer Jenny that Team Rocket are very bad. Team Rocket comes out of the emergency room all wrapped in bandages. They claim that they did not steal anything. Ash and co. doesn't believe it. Team Rocket has a flashback when their sub was wrecked. Officer Jenny tells Team Rocket that they have to come with her for interviewing. Suddenly, Team Rocket feels all better, and they rush out of the building with Officer Jenny chasing them. A pirate ship comes closer to the island. One man peers through his telescope. He sees the school of Lapras. The captain, notified of this, tells the man to get the weapons ready. Ash and co. are surfing on Lapras. They hope to catch up with the other Lapras. Misty asks Ash how they will convince the Lapras that they are their friends. Ash shows them a smile, but Tracey says that Lapras are good at understanding words. Meanwhile, the captain fires the Pokéballs at the Lapras. Tentacruel are sent out from them. The Tentacruel fires a Poison Sting at the Lapras, but a Water Gun blocks off the attack. The man fires more Pokéballs out, and Tentacruel keeps on popping out. Ash and co. sees the Lapras and pirate ship. Tracey notices the Tentacruel right away. Ash looks up Tentacruel in his Pokédex. Tracey knows that he has to get Officer Jenny. He sends out Marill and jumps into the water. Misty tells Tracey to be okay. Ash and Misty decides to stop the pirates themselves. Meanwhile, Team Rocket is underwater following the group. They want to see Ash and co. paralyzed from the Tentacruel so that they can escape with Pikachu. The Lapras has now been surrounded by the Tentacruel. The pirate ship closes in on them. The Tentacruel prepares for a Poison Sting attack. Ash tells Pikachu to use Thundershock. Pikachu fires the attack, but the electricity shocks everyone including Ash and co. Ash forgot that electricity and water don't mix together. The captain is furious that Ash and co. had to hurt the Tentacruel. His assistant fires the cannons at Ash and co. Lapras dodges each one. Misty sends out Staryu, Poliwag, and Goldeen. Ash sends out Squirtle and tells it to do whatever Misty says. The Pokémon fires at the ship. Parts of the ship falls apart. The captain tells his assistant to fire, but they have ran out of cannons. He uses his assistant as a cannon, and the assistant is fired at sea. Ash gets the Tentacruels attention by spraying water on them. The Tentacruel begins to chase Ash. Ash tells the Lapras to make their getaway while he keeps the Tentacruel busy. The Tentacruel begins to catch up with Ash. Team Rocket is trying to catch up with Ash. James says that they are behind Ash, so they will get hit first. James is right, and Team Rocket blasts off again. Misty has the crew tied in ropes. She sees that the Tentacruel have caught up to Ash. She tells them to call off their Tentacruel, but the captain refuses to, resulting in a spray of water in the face. The Tentacruel surrounds Ash. Lapras uses Water Gun on one of the Tentacruel. The captain tells Tentacruel to use Supersonic. Ash, Lapras, and Pikachu are in a state of shock as the powerful waves hit them. The leader Tentacruel hurls an attack at Ash. Before the attack can hit him, an Ice Beam freezes the Tentacruel right on the spot. More Ice Beams are let out freezing all of the other Tentacruel. The school of Lapras saved Ash. Lapras goes up to its family. All of the Lapras accepts Ash's Lapras. Officer Jenny has all of the crew and Team Rocket tied in ropes. Team Rocket is pretty angry that they have to pay charges. Misty tells the Tentacruel that they are free to do whatever they want. The Tentacruel smiles, and they jump into the ocean. Ash is making his final goodbyes to Lapras. He tells Lapras to be happy. Lapras throws Ash into the water, but is only kidding around. Lapras's parents calls out for Lapras. Ash tells Lapras that it is time for Lapras to leave. Lapras remembers all of the good times it has had with Ash. Lapras lifts Ash back up to the boat. Then Lapras swims back to its family. Ash and co. says goodbye to Lapras as they swim away.